Cool! This is my kind of everyday outfit. 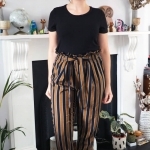 Plantain is my go-to tee pattern – so perfectly drafted – and as for your hack on Anima pants, I think these are great but, yes, they could be even more flared for a total culotte effect. 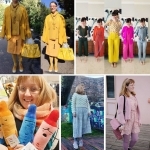 BTW, I think there’s some information missing when you say “Here’s some of the inspo I found while dreaming these up:”. There is no image or link following… or was it blocked by my software? It didn’t show up in my Blog Reader either, but once opened to Katie’s blog it shows up. 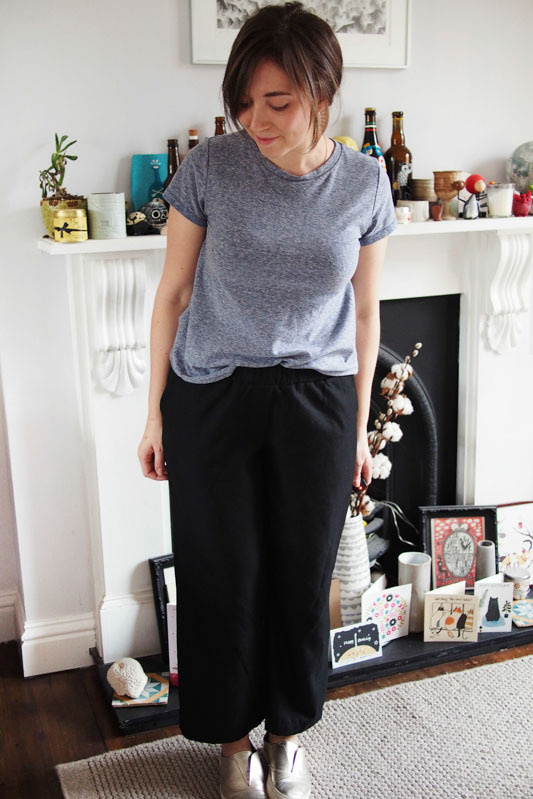 There are several images from Pinterest of similar cropped, straight-leg trousers. Thanks! I’ve added a note to the post – the Pins won’t show up in blog readers I don’t think. I love basics! There’s something about a gray t-shirt that always makes me so happy… ha! We all need essential wardrobe basics like these! 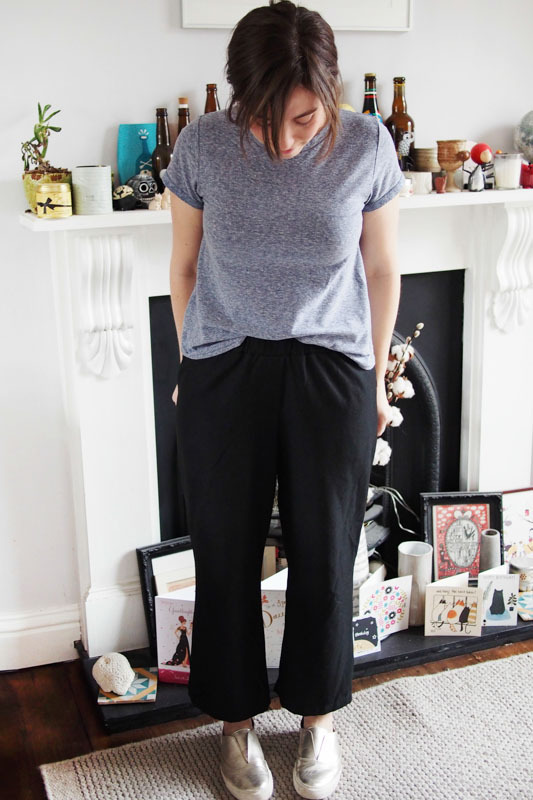 I really like your straight trouser leg hack. 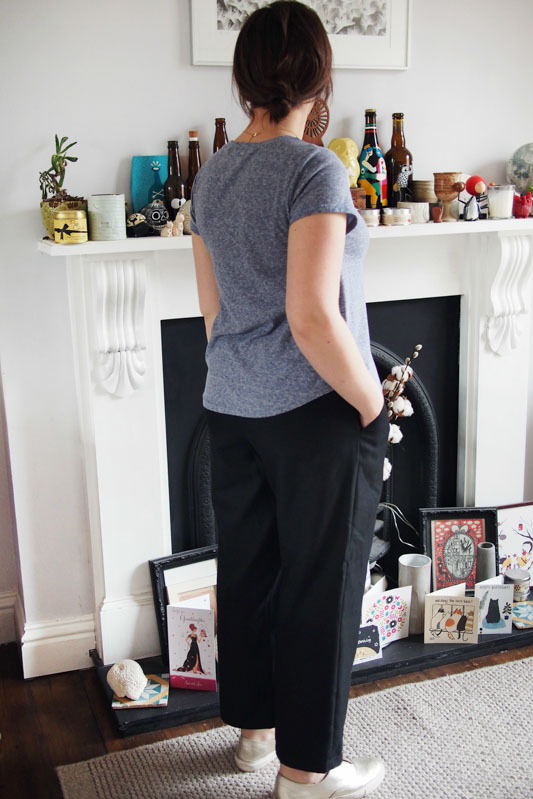 I have just made 2 pairs of straight leg trousers (elastic waist), to be blogged, as I prefer this style to a tapered leg. It suits you too. I love this! I want to live in that teeshirt. I’m consistently impressed by the Plantain…I would gladly have paid $$$ for it, but it was free! Such a versatile and well-drafted pattern! Yeah, it’s my dream tee and so easy to make little tweaks for different looks. Katie- I am doing the same thing right now. I have decided to only wear clothing I have made for all of 2016. I have wanted to do this for a while, and I kept thinking I would get all of my clothes ready first, but where is the fun in that? So, I am just going for it. 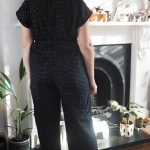 I am not ready to stitch jeans, so I have been experiementing with trousers like this. Your version is awesome, and I think I will make a pair today! You inspire me with every blog post. Great challenge, good luck, and great idea to just dive in – you’ll very quickly identify what you really need to make I’m sure. I love the pants. Based on your inspiration pins, it looks like you have the width right but could stand to shorten the inseam by an inch or two. I used to live in some pants like these before skinny jeans took over my wardrobe and the world. I think it’s time I revisit my old love. Thanks! I think you’re right, a touch shorter would be good. It’s nice to have a skinny jeans alternative! Really stylish! I love both items and they look great paired with those shoes. Good quality plain fabrics are really worth collecting, I often find them more useful than the myriad of prints I’ve collected over time. 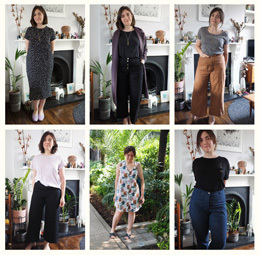 You’re inspiring me to make some stylish basics too. Totally with you on sewing the basics. Obsessed. The will be worn and loved the most. I love to sew wardrobe basics. For me it usually means a lot of t-shirts, leggings, camisoles, and underwear. Comfy clothes are the best. I love to have those shirts in my closet that make me feel good about myself even when I am feeling crummy! One thing I have not tried yet is leggings! I need to give underwear another go, too. Katie I love your style! I think this is the perfect everyday outfit! Your plantain fits so well!! I love the changes and the trousers are fantastic! Thanks! 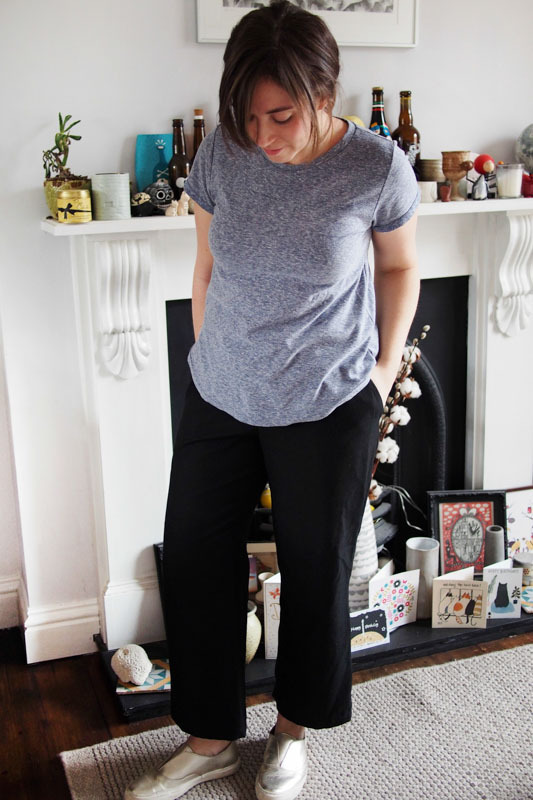 I’m always a bit wary of blogging ‘boring’ stuff like this, but it’s certainly everyday and wearable. I hear you on the basic stuff! Before blogging all I sewed was party dresses, but it makes so much sense to sew what you wear the most. Great outfit! Perfect basics. I have trouble getting the motivation up to make things like these, but once I do it, I wear them constantly. 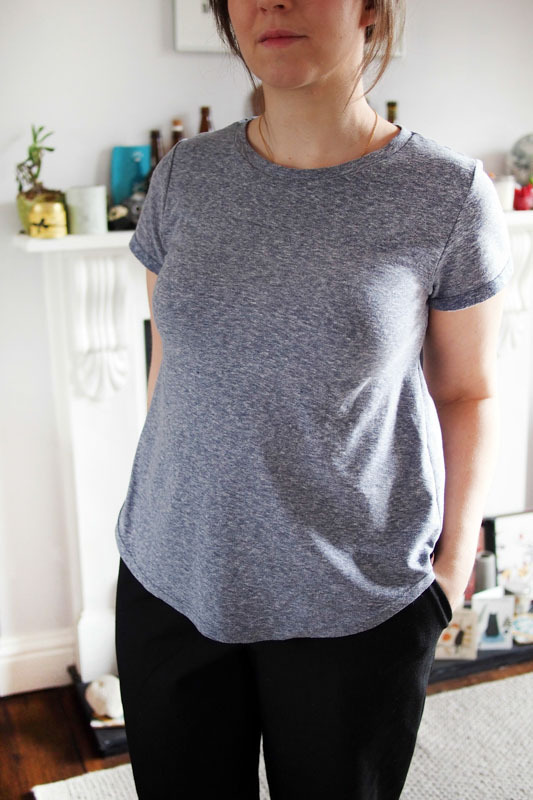 I have a Jasmin Tee that I wear to death, and it was supposed to just be a wearable muslin! 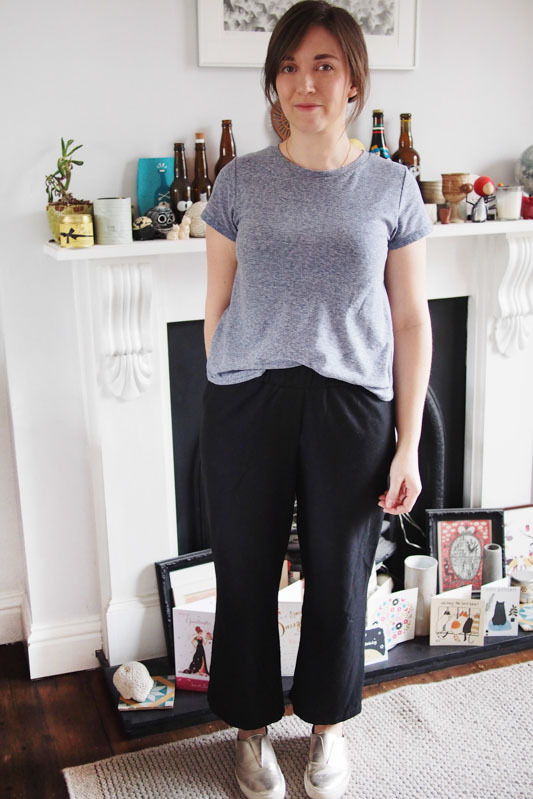 This is just the kind of basics loungewear I’ve been looking for! Something soft and lovely but still put together. Do you have a link for the tee fabric? Sorry, it was a remnant from in-store only unfortunately. You’re queen of the cool basics, Katie! Yay for pattern hacks and their infinite possibillities!